Beautiful, ground floor, fully equipped 2 bedroom condo in the amazing Grande Rockies Resort, close to downtown Canmore and all that it has to offer including many restaurants, shops, museums and outdoor activities including the amazing Nordic Center (cross-country skiing and snowshoeing). Canmore is the ultimate adventure playground and destination for year round activities, events and is the perfect holiday destination. Our condo is fully equipped with everything that you need for a wonderful vacation. Master suite with king bed and en-suite bathroom complete with steam shower. Second bedroom with queen bed. An additional full main bathroom with a large walk-in tiled shower. Full kitchen with granite counter tops, bar counter, oven, microwave, dishwasher and all the comforts of home. Living/Dining room with queen sofa bed and dining table. Flat screen TV, Internet, Cable and Gas fireplace. Large patio with access to green courtyard, patio furniture and natural gas BBQ. 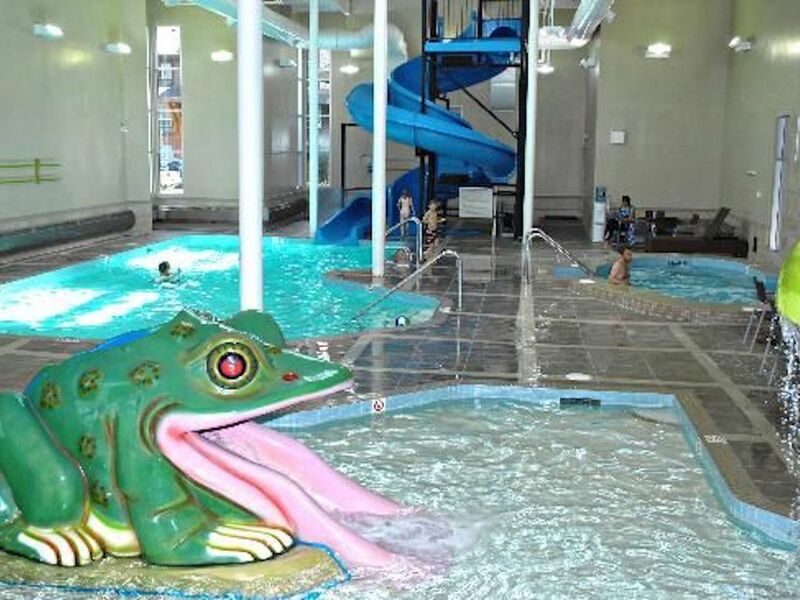 The resort boasts an indoor pool with water slides, children's pool, indoor/outdoor hot tub, gym, seasonal bar & restaurant, heated underground parking and many other resort style amenities. The historical town of Canmore is situated in the beautiful Rocky Mountains and has everything you need for all season activities. Close to downhill and cross country skiing, and many world class golf courses. Shopping, numerous dining venues and entertainment are all within walking distance. The town of Banff is a 15 minute drive with many further mountain activities and tourist attractions such as hot springs, skiing, hiking, wildlife watching, scenic drives and world class restaurants. We have provided you with a National Park Pass for use during your stay (saving you $20/day in park fees). We've equipped our condo with everything you will need for a fabulous holiday - games, many cooking utensils, linens, kids equipment such as playpen, booster seat and an ample supply of everything that you will need for an amazing, care free time. Please note that all taxes are included and that there are no additional parking or Resort fees. Fees are shown in US dollars. Send us a request and we will give you the quote in Canadian dollars. Ensuite bathroom has a steam shower with stereo. Main bathroom has a large, walk-in tiled shower. Clean, well kept rental, not far from Banff. Owners send clear check-in instructions and information prior to the trip, which was much appreciated. Nice patio area to relax and cook out on. The owners also provided us with a NP pass, which was VERY thoughtful. I would definitely stay here again. This place is awsome !! Great pool , hot tub! Very close to downtown !! We had a wonderful stay at this condo. Our kids absolutely had a blast, especially at the pool. It was a great base for exploring the mountains. The owners were very helpful and accommodating! Great Location. Comfortable Beds. FUN pool & hot tub! Otherwise, the condo worked well for us. Sorry you noticed a few issues and thanks for letting us know. We have addressed most of them now. We're glad you enjoyed your stay! The condo was just as advertised. The kids loved the pool area and we loved the steam shower. Having the park pass was convenient and saved us a fee each day. We had no issues at all and would definately stay again if in the area. Thanks Wayne and Jolene for letting us rent this great space!! Long week-ends have a 3 night minimum stay. Prices are shown in USD. Please just send us a request with dates and we will send you a quote in Canadian dollars.